Home / Market Insight, Financial Articles / Who Would Buy GameStop, And How Much Would They Pay? Who Would Buy GameStop, And How Much Would They Pay? 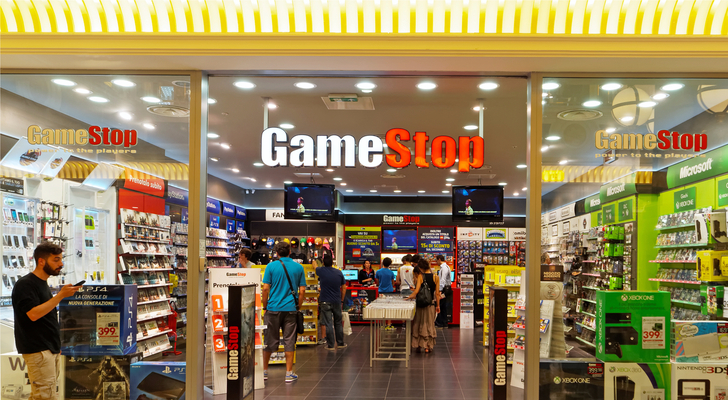 GameStop (NYSE:GME) reported second quarter results Sep. 7 that was a mixed bag with earnings of five cents, three cents lower than analyst estimates, and revenue of $1.65 billion, $30 million above the consensus. The news sent GameStop stock lower. When you’re a wounded duck like GameStop, you’ve got to deliver on both the top and bottom line. Failure to do so is almost always bad news for a stock. It’s been a painful five years for anyone still holding GME stock today after hitting a high of $57.74 on Nov. 14, 2013. Almost everything that could go wrong for the video game retailer has gone wrong, and yet, it’s still making money on both a GAAP and non-GAAP basis. In 2017, GameStop made $3.34 a share on an adjusted basis. Management’s latest guidance suggests it will make adjusted EPS of $3.00 a share in 2018 from flat to -5% same-store sales. That said, if you look through its Q2 2018 report, there are a few nuggets of positivity including the five-cent non-GAAP profit. Unfortunately, there aren’t enough of them to keep GameStop stock from continuing its long march to single digits. On Nov. 14, 2013, it hit $57.74. Two years and two months later — Jan. 15, 2016 — it closed at $25.64. It took 26 months to lose 56% of its value and another 32 months to lose 37% of its value. GameStop is currently undertaking a strategic and financial alternatives review to figure out the best way to rescue some shareholder value before it disappears entirely. The end game has to be a sale because any other solution is just putting off the inevitable. So who would buy GameStop? And more importantly, how much would they pay? There’s always private equity, but you can be darn sure they won’t be offering top dollar for GameStop’s business. There were rumors in June that Sycamore Partners was interested in the specialty retailer, and they’re likely not the only ones. From a strategic buyer standpoint, it would have to be somebody that’s already quite successful in the digital gaming business who wouldn’t mind using the brick-and-mortar locations as physical billboards in much the same way Apple (NASDAQ:AAPL) does with its retail stores. Again, I could throw out a bunch of names, but it would be pure speculation. How Much Is GameStop Stock Worth? Based on a market cap of $1.58 billion, GameStop’s enterprise value is $2.12 billion ($1.58 billion + debt of $819 million – $280 million in cash). Over the past decade, GameStop’s best year in terms of generating positive free cash flow was fiscal 2013, when it converted $354 million of income into $637 million of free cash flow. Why do I care about 2013? Any buyer considering an offer has to determine how it gets from today’s results to something similar to 2013. That’s because it’s the free cash flow that it will use to pay down the debt to buy GameStop in the first place. That said, I just don’t see anyone offering more than a 20% premium to its current share price. If somebody offers $19 a share, the board would be crazy not to accept it. This time next year, I don’t see GameStop stock in double digits. Article printed from InvestorPlace Media, https://investorplace.com/2018/09/who-would-buy-gamestop-and-how-much-would-they-pay/.